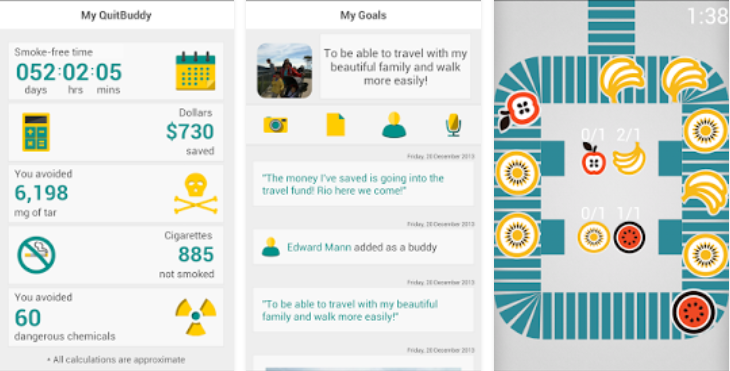 My QuitBuddy is a mobile app aimed at helping users with smoking cessation. When users open the program for the first time, they must select whether they want to quit now, quit later or continue quitting. Then, users fill out a brief questionnaire about their smoking habits (e.g., how many cigarettes they smoke in a day, quit date), which the program uses to customize the information. The program’s main features include a quit tracker that displays the amount of time that has passed since the user began the quitting process and the amount of money the user has saved. The users can add their goals, along with a picture and an audio recording, which will be displayed on the main page. The app offers an online forum of users to provide peer support through the quitting process – which was active in the evaluation time. Additional features include: information about bodily effects of the quit process, quit tips, distraction tips, a game- for moments of craving, and reminders to log in. My QuitBuddy is a program targeting mostly users going through the smoking cessation process. Although the program’s main feature is the tracker that states the time passed since the user’s last cigarette, the program’s advantage – in comparison to most trackers – lies in its supportive online community. At the time of evaluation, the community seemed to be available to provide relevant support. On the downside, the program’s visual design is outdated and the layout is somewhat disorganized.